We celebrate this year by remembering the wonderful underwater films by Jacques Cousteau, as it would have been his 100th birthday on Friday. Take a tour of 10 locations from The Silent World and other film clips on our Ocean showcase following Captain Cousteau as he explored our connection to the Ocean World. Take a highlight tour through 10 Cousteau film clips. We as well have added the third Hope Spot tour with Sylvia Earle’s Mission Blue foundation to the Ocean Showcase, where you can visit 5 more special places in the ocean in need of protection from the Chilean Fjords off South America, to the deep sea angler fish in the Charlie Gibbs Fracture Zone, to the surfing hippos off the Gulf of Guinea off West Africa to the Outer Seychelles and Kermadec Trench north of New Zealand. You can now explore any of the Hope Spot posts in the Ocean layer in Google Earth by clicking on the yellow highlighted circle icons in the ocean. See Hope Spot content highlighted with yellow circle icons in Google Earth. 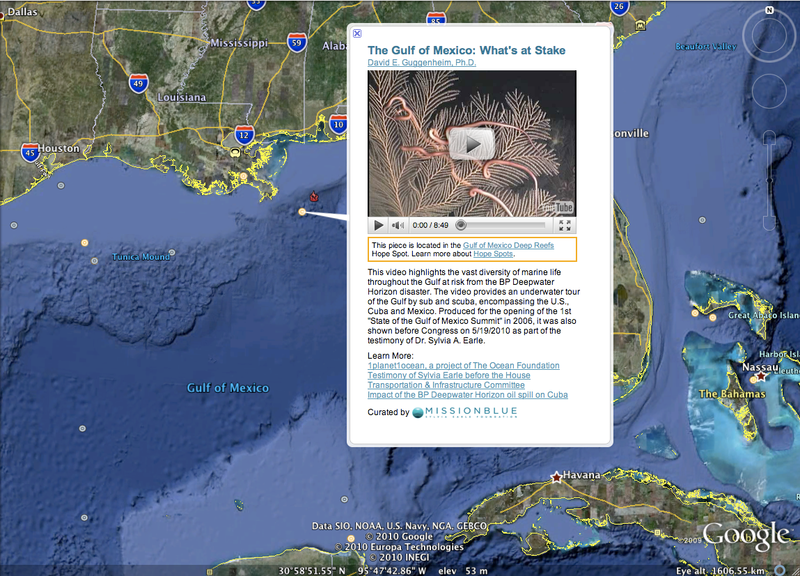 Click on the flame icon in the Gulf of Mexico to get more information on the Deep Horizon oil spill. Celebrate the opportunities and challenges of our shared resource, the Ocean. See the cost of the Gulf of Mexico oil rig explosion with new data, as that oil spill tragedy unfolds by clicking on the default on placemark southeast of New Orleans, USA. Dive deeper on your own using Google Earth. Today is the second annual United Nations-designated World Oceans Day.